UPDATE (JULY 2014): Somicro gets new Mixcloud, Steam, VK, Etsy and Hangouts icons. Additionally, icons for Youtube, Spotify and Google+ have been updated. UPDATE (MAY 2013): Somicro gets new App.net, GitHub, Messenger (generic), StackOverflow, Yelp, Indiegogo, Foursquare and Kickstarter icons. UPDATE (OCTOBER 2012): Somicro gets new DeviantART, email, Soundcloud and Orkut icons. UPDATE (JUNE 2012): Somicro gets a new Pinterest icon and has its Twitter icon updated with the new colors and logo. UPDATE (APRIL 2012): Somicro gets a new Instagram icon and has its Stumbleupon icon updated with the new colors and logo of the site. Somicro is licensed under Creative Commons Attribution Share-Alike 3.0 Unported. You are free to share, use and modify this work for personal or commercial purposes. You do not have to credit us in your work or on your site but a linkback to Vervex.ca, Veodesign.com or this DeviantART page is always appreciated. This icon pack may not be redistributed or sold for profit. 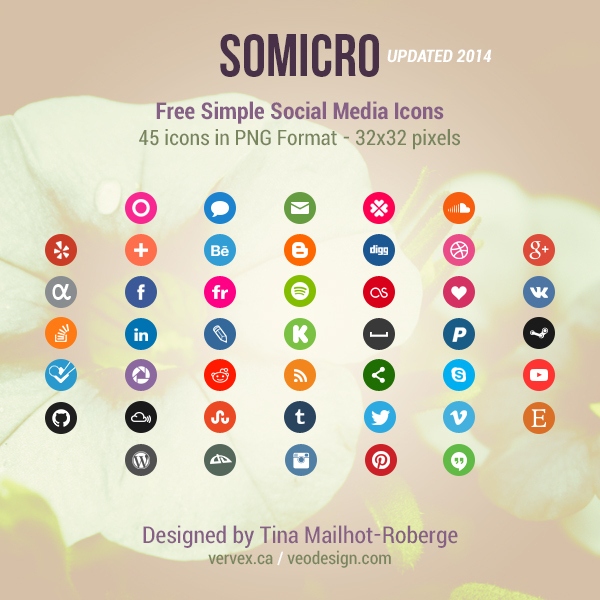 Somicro contains 45 icons covering most of the popular social networks out there. In the pack come 2 sets; one with a border and one without, in total 90 icons. It’s aim is to be used on the web, hence the small icon size. This set was created by Tina Mailhot-Roberge. hi! just want to told you a little more thx. You got a link on my partner page for providing these free icons I use on my web site! Definitely amazing and nice work done..Thanks a lot of this. Just wondering, is there any possibility to add a button for NewGrounds and for Twitch? Could you possibly add periscope, ravelry and craftree.com ?? Google+ changed their logo about three or four months ago, I think it was. Can you update accordingly? is it alright if i use these icons in my business card design? Thank you for making these available Used them on my DA profile page. Perfect, I have been looking for some good looking Icons for Deviantart, and being lazy, meant I didn't make them myself. Thank you much appreciated. 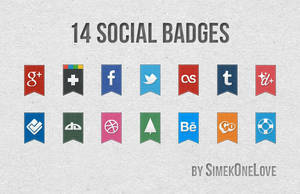 Can I use few of these icons in my website template I'd like to sell on Themeforest.net? How about a Vine App icon? Any chance of a Twitch.TV icon in the future? Any chance of adding a Pinboard icon?